This is the remains of a four room house at Tell Beersheba. Do you see the four rooms? GRIN. Don't worry. It took forever for your tour guide (Digger Doyle) to figure it out. See the diagram on the right for an example. Note that in the photograph, the house is turned sideways from the diagram. For more information on the floor plan of the four room house, see the The Model of a Four Room House. So what is the significance of a four room house? Well, another question might be how do you know whether an excavated house is Israelite? You guessed right. 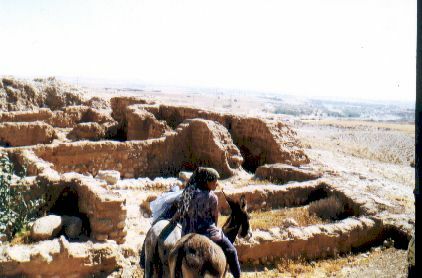 A four room house is characteristic of an Israelite house. Of course, there is some debate on this among archaeologists, but when do scholars of any kind agree on anything? We do know these houses started appearing in the hills of Israel during what is commonly dated to the period of the Judges (about 1200 BC). They became more common through the monarchy of Israel (approximately 1000 BC to 586 BC). This page has had [an error occurred while processing this directive]!